Fox has a great new idea for a drama: get together six friends from the same graduating class, put them in a series chronicling their lives on the way to their 20th reunion, and watch the hijinx ensue. My take: for this to work there needs to be liberal usage of era-specific comedy a la The Wedding Singer. Think of all the ridiculous fashion that could be trotted out: from parachute pants and Balloons, straight to low-cut jeans and Uggs. And the music! And the drugs! Dammit, can I put this in my TiVo, like, today? Tonight on Spike TV, Bruce Willis hosts his own parenting how-to, True Dads. His position is, to be a "True Dad," you need to do more than just earn a living and play catch with your kids. You also have take an interest and teach them the fundamentals, like how to bang broads less than half your age and proper etiquette for acting like a jackass on a movie set. ABC clearly learned its lesson from the Nicollette Sheridan/Monday Night Football promo debacle- there's no such thing as bad publicity. And to prove it, word has "leaked" that they're shooting a Desperate Housewives-related promo for the premiere of their NBA coverage. "Something we'd like never to hear again: Reality show contestants complaining about how they were edited. Listen, you silly pawn, take your 15 minutes and choke on it." 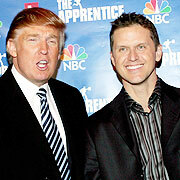 On the three hour season finale of NBC's not-as-big-of-a-hit-as-it-once-was The Apprentice, The Donald hired software executive Kelly Perdew. Was he most deserving? Will he make a good leader? Will he cash in with a book and TV deal of his own? You got me. I'm blissfully ignorant of this tedious reality phenomenon, and I found the 17 cumulative minutes I've seen of this show roughly comparable to watching flies copulate. Thankfully, we have a few Apprentice-free weeks before Mr. Trump gets edition 3 up and running. This week, Uncle Buster takes issue with my review of Lost- even though he's never actually watched it. Here's his own, less flattering, 99 word take. Why didn’t Tarzan have a beard? I can’t answer that. Nor can I accept the myriad of flaws in the premise of Lost. Reality shows are a waste in the first place, so a blatant reality show rip-off is an offense to the senses. “Hottie” Airlines crashes somewhere in BFE. The good thing about this airline: even if you are 8.9 months pregnant, you can still fly across some large body of water. But, they’re so damn good looking, who cares? I’m just glad the body shavers and hair care products survived the crash. My opinion: Lost should be. "Lost" airs Wednesday nights at 8 et/pt on ABC. Which of the following statements about The A Team is false? A) Premiered on NBC-TV immediately after the 1983 Super Bowl. B) Face's real name is not Templeton Peck. C) No one was ever killed on the show. D) The "crime they didn't commit" which led to The A-Team being sent to military court was stealing from the "Bank of Hanoi" during the Vietnam War. The answer is C. Only one person was killed on the show- General Fullbright (played by Jack Ging), who was shot and killed in the season 4 finale. Is ABC Desperate Enough To Move Its Sunday Hits?